Making contact with a therapist is a very brave step and may feel daunting. If you choose to make an enquiry about sessions with me, I will arrange a time for me to call you for a brief conversation to find out about your difficulties and tell you more about me. I find this makes the initial consultation a little easier for you, as we will have already introduced and gained a sense of each other. Your initial consultation will take approximately one hour and we will be both be seated. In this session I will ask you questions about the difficulties that have brought you to me and will ask for your ideas about possible triggers and maintaining factors. I will ask you about your current circumstances and your personal and family history. If we agree that therapy would be helpful for you, we will decide what your goals for therapy will be, the type of therapeutic approach I will take and agree on a rough estimate for how many sessions of therapy we will have together. This will be reviewed as sessions progress. Subsequent sessions will last approximately fifty minutes and will take place once a week at an agreed time. In these sessions I will use different therapeutic interventions to explore your experiences and help you develop new ways of thinking and behaving. I may recommend that you engage in certain tasks in between sessions, in order to help you practise new ways of thinking and behaving and maximise the efficiency of therapy. Every so often we will take some time to review your progress and think about when would be a good point to end our sessions. At your final session, I will provide you with an end of therapy letter, which details the work we have done and the progress we have made together. Many clients find this a powerful tool in helping them see the progress they have made and maintaining that progress. As our sessions come to an end, we can agree whether it would be helpful for you to have a follow-up session. Follow-up sessions tend to take place one or two months after therapy has finished and provide an opportunity to check that you are continuing to progress and reap the benefits of therapy and a chance to discuss any "blips"- or areas you want to revisit. 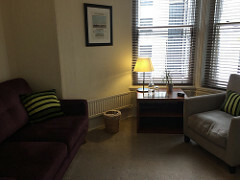 Assessment and subsequent sessions take place in a comfortable, quiet room in North Kingston, a ten minute walk from either Kingston or Norbiton stations with easy parking on street. 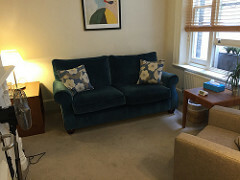 I also have consulting rooms on Museum Street, just by the British Museum and three minutes walk from Tottenham Court Road tube station. In certain circumstances, I can visit you at home to conduct therapy sessions. Please feel free to ask me about this when you make contact. We will discuss any periods of leave that either of us need to take due to holiday. You will not be charged during these periods.